A simple yet elegant Chocolate Orange Ricotta Tart. This Italian treat is made with a crumbly pastry crust, a silky smooth filling of ricotta and mascarpone cheeses. The zest of mandarines with its juices adds a lovely citrusy scent. And of course some grated semi-sweet chocolate simply because chocolate does indeed make everything better. This post was originally published April 14, 2017 and updated with new content and photos March 25, 2019. Growing up Italian in a predominately french city, there never was any lack of desserts after a fine celebratory meal. Easter Sunday was no exception especially after a mandatory and traditional simple roast of agnello or rather lamb. Desserts as well never wavered far from the customary sweets from way back home in Italy. One in particular which graced our table each and every Easter was la casata. A typical tart from my home town made with ricotta, sheep’s milk cheese and chocolate which utilizes many eggs. It always had mamma and her sisters vying for the coveted spot of who used the most eggs. It’s not unusual to use anywhere from 20 to 30 eggs when making la casata from my Paese in the Lazio region of Italy. Although not my mamma’s casata this chocolate orange ricotta tart still pulls at my heartstrings. It’s somewhat similar in taste to the one I grew up on but way much lighter and not as dense. We begin with a a crumbly short crust pastry that is really quite easy to make. It’s then rolled out and used to line the tart tin. You’ll find it to be quite forgiving if any breakage occurs and can be remedied by working it back together with either your fingers or the back of a spoon. You’ll want to pierce it with a fork before filling it with the ricotta mixture so that no humps occur while baking. I used a 10 inch tart tin with a removable base but you can also use a 9 inch tart tin. You will however want to divide the pastry dough in half while using one half and freezing the other to use at a later time. Or you can make some pretty cut out cookies with the remaining dough and use to decorate the tart. You’ll also have to compensate for the slightly smaller tart tin by reducing the amount of time baked. Orange and chocolate are one of my absolute favourite pairings. Since I had so many sweet mandarins lying around I decided to use both the zest and the juices from this sweet fruit. You can however substitute the mandarins with the zest of an orange. 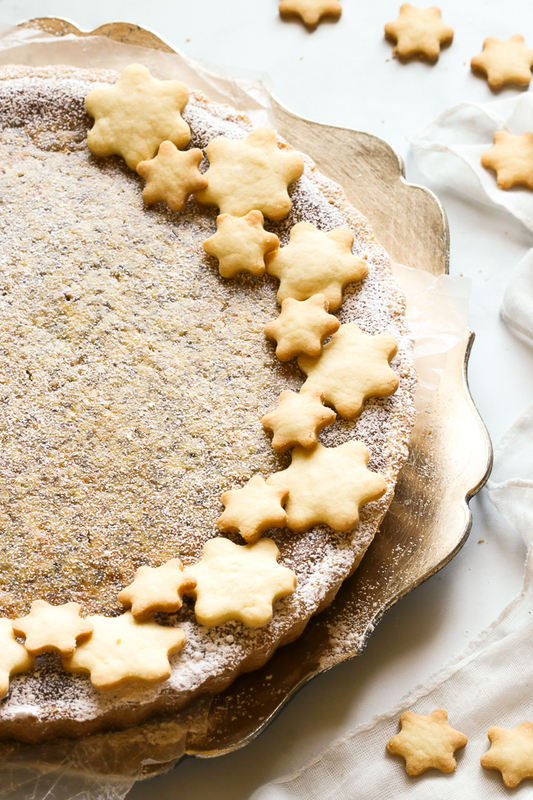 All that’s needed is a light or generous dusting of icing sugar just before serving. 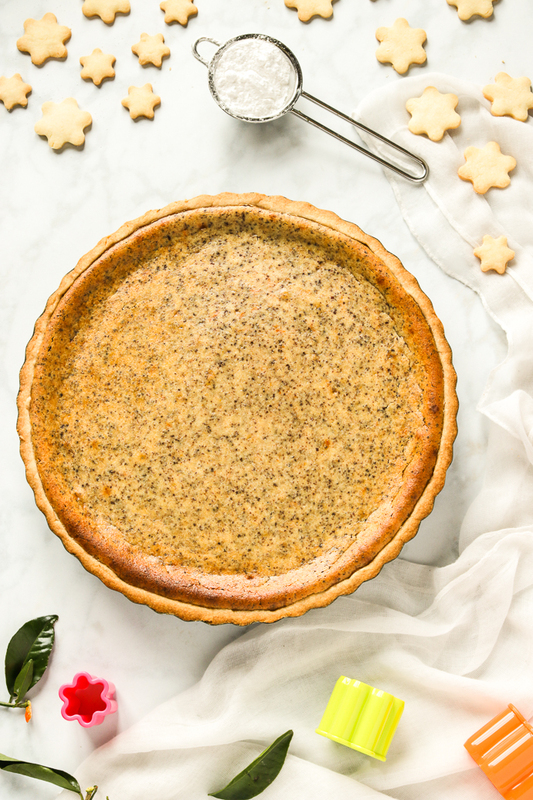 This creamy and dreamy tart is especially delightful with your favourite cup of coffee or tea! Enjoy while still warm or cold. 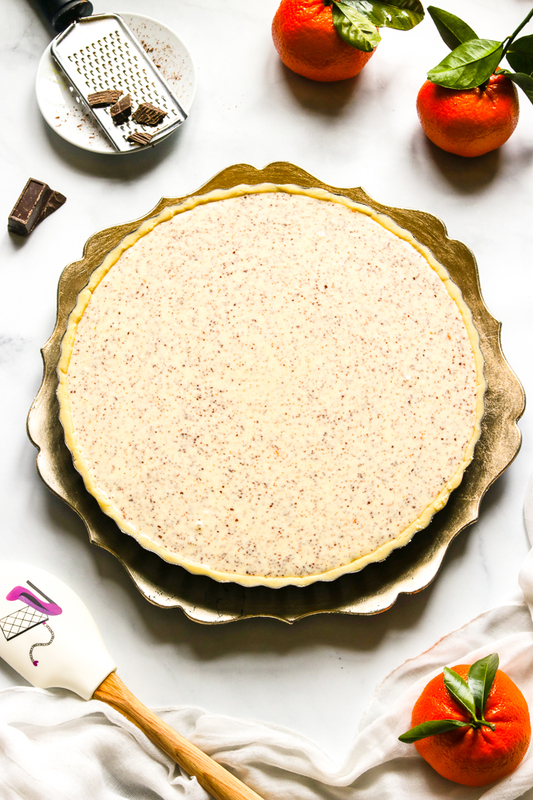 Chocolate Orange Ricotta Tart is a light Italian torta made with a pastry crust, ricotta and mascarpone cheeses, grated chocolate and scented with orange zest. In a large mixing bowl beat the butter and the sugar until smooth. Add in the egg yolk and beat until thoroughly combined. Transfer the mixture to a work surface and work the dough with your hands until you get a smooth pastry dough. 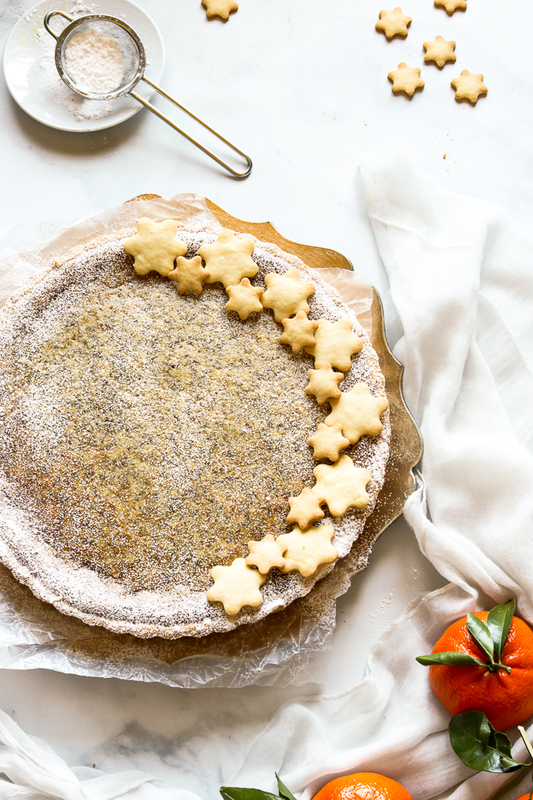 Roll out the pastry dough on a lightly floured work surface and carefully transfer the dough to a 10 inch round tart tin with a removable bottom. Preheat the oven to 350 degrees F and start making the filling. Place the ricotta and the mascarpone cheese in a large bowl and beat until smooth. Add the sugar, eggs, orange juice, zest and beat until thoroughly combined. Fold in the grated chocolate then pour the mixture over the prepared pastry dough. Bake for 50 to 60 minutes until the filling is set. Remove the tart from the oven and let cool in the tin. Recipe is adapted from Cafe Italia cookbook by Liz Franklin with a few switch ups. I substituted the lemon juice and zest with mandarin juice and zest and added 2 ounces of grated semi-sweet chocolate.The original recipe called for using half the pastry dough, baking it in a 9 inch tart tin for 45 minutes.I used a 10 inch tart tin, used the whole amount of pastry dough and therefore increased the baking time by almost 15 minutes to compensate for a bigger tart. Pastiera Napoletana Recipe, an Italian citrus scented grain and ricotta pie with the sweet perfume of orange blossom water that is immensely popular in Naples. In la bella Napoli, pastiera is synonymous with Easter and every home in Naples will be dishing out their own version of this pie made with grano cotto, cooked wheat. Throughout Italy the use of eggs and grains are predominate during Easter time as its said to represent new life and harvest. This pastiera has many similarities to the one mamma would make but without the grano cotto! At times she would use a whopping 30 eggs in her Easter casata! I have yet to post mamma’s casata recipe because I haven’t perfected it yet. Last Easter and under the guidance of my zia Maria, I attempted to make my own for the very first time. To say that it was not picture worthy is an understatement! After committing several hours in bringing our coveted Easter dessert to life…you see, I really had high expectations here and did not want to mess it up. However it came out looking much as Mount Vesuvius must looked after its catastrophic volcanic eruption! 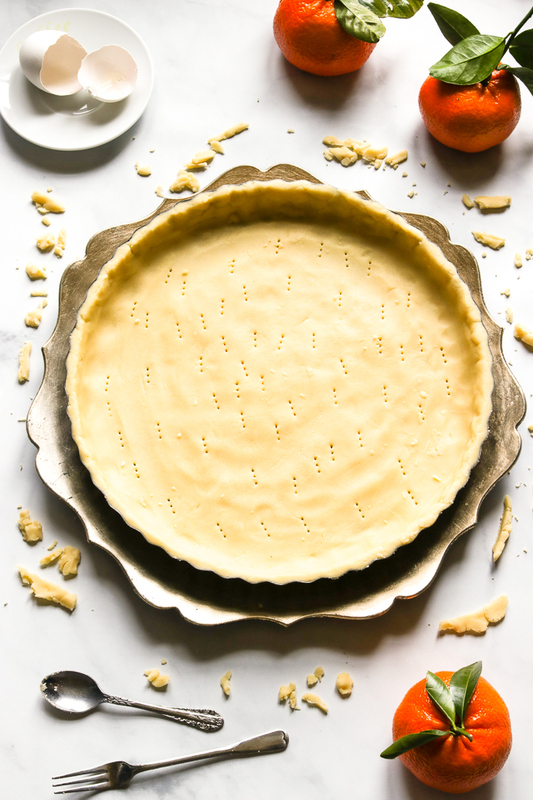 Don’t be intimidated by the length or even the many steps of this pastiera because really you can pace yourself by starting three days before your ready to serve this ricotta pie. In fact if using hard wheat berries as I did, you’ll need to soak them overnight or better yet allow them to soak for 24 hours as this will reduce the cooking time by half, otherwise they’ll need a full two hours to cook. Or take an even shorter cut and buy the pre-cooked wheat variety which are sold in glass jars or cans from Italian specialty shops. You would then simply proceed to the next step of simmering the cooked wheat with milk, vanilla bean and lemon zest to infuse the flavors. Alternately the wheat berries can be substituted with quick cook farro or even cooked rice such as arborio rice. You can make the pastry dough a day ahead as well but it will probably need to set at room temperature a bit before rolling out. One other ingredient quite common in a Pastiera Napoletana Recipe is the use of candied peels such as lemon and orange. I’m simply not a fan of candied peels so I omitted them. I always take great care in plucking them out of my desserts! I love this pastiera with its grainy texture and the soft bite from the grano cotto, cooked wheat berries. These little grains just pop in the mouth when cooked properly, much like a bowl of rice krispies with milk does. I can’t stress enough how wonderful this Pastiera Napoletana Recipe tastes when made ahead! Its a symphony of a soft creamy interior perfumed with aromatic orange blossom water, encased in a lovely pasta frolla! Buona Pasqua , Happy Easter everyone! Pastiera Napoletana Recipe, an Italian citrus scented grain and ricotta pie with the sweet perfume of orange blossom water that is immensely popular in Naples. Rinse the wheat berries well and place them in a small bowl with enough water to cover. Allow to soak overnight or up to 24 hours before you plan to bake the ricotta pie as this will allow for quicker cooking time. Rinse and drain the wheat berries and place them in a pot with 2 cups of water and bring to a boil. Reduce the heat and let simmer for about 1 hour or until tender. Drain any remaining liquids and set aside while you prepare the pasta frolla. Place the flour, sugar and salt in the bowl of a stand mixer and stir to combine. Add the cubed butter and mix till coarse crumbs form. Mix in the lightly beaten eggs,vanilla extract and orange zest until it forms a smooth ball. (takes less then a minute). Wrap the dough in cling wrap and allow to chill in the fridge for 1 hour. Meanwhile place the cooked wheat in a medium sized stock pot. Add in the milk, vanilla bean and lemon zest. Bring to a boil over medium heat then reduce the heat to a simmer and cook until all the liquids are absorbed while stirring often. Makes sure to keep an eye on it so the wheat berries do not stick to the pot and burn. Discard the vanilla bean and keep aside to cool. While the mixture cools, grease a 25cm round tart tin with a removable bottom and set aside. (I used a 25cm (10 inch) deep quiche pan with removable bottom however any 10 inch pie dish would also work). Cut a quarter of the dough off, reserving it for the lattice top. Roll out the remaining dough to about 1/8 inch thick and line the tart tin with the rolled dough. Trim off any excess dough with a knife. In a medium sized bowl mix together the ricotta, the 2 whole eggs plus 2 egg yolks until light and fluffy. Mix in the powdered sugar (icing sugar), orange blossom water, orange and lemon zests until combined. Stir in the cooled wheat mixture. In a separate bowl beat the two remaining egg whites just until stiff peaks form and then softly fold them into the ricotta mixture. Pour the ricotta mixture into the prepared pie. Roll out the remaining pastry dough and cut out 6 strips slightly longer then the pie tin. Place the strips of dough over the filling in a criss-cross pattern and trim off any excess. Brush the strips of dough with milk and bake the pie for about 50 to 60 minutes or until a lovely golden brown. Allow the ricotta pie to cool completely before refrigerating then dust with powdered sugar just before serving. This ricotta pie actually tastes better the day after it is baked making it a great make ahead dessert. When brownie meets cookie a delectable Triple Chocolate Brookie Tart is born. Made with dark cocoa powder, raspberry chocolate and mini semi-sweet chocolate chips then topped with a luscious raspberry buttercream. This treat makes a delightful chocolaty and fudgy dessert for those special days when CHOCOLATE is absolutely the answer! There are days when we ladies are faced with some really tough choices….right? Sometimes its as simple as choosing the right colored lipstick or nail polish depending on our present mood. Should we make a bold statement and select a fiery cherry red or maybe we are feeling somewhat romantic and flirtatious and we decide to settle on a dusty shade of pink! Other times, if your a foodie and a chocoholic like I am then our moods and thoughts consistently juggle on whether to have brownies or cookies to mark special occasions. My friends, this crossover Triple Chocolate Brookie Tart will surely win you and your family over! At first glance it may seem like a simple tart but one bite will transport you from simple to sublime with its dense, fudgy texture and a blissful chocolate raspberry taste! Since no tart is complete without a little embellishment, I decided to top it with a yummy raspberry buttercream to compliment the chocolate raspberry and I pipped on some pretty swirls with the 1M tip! However, you can use any decorative piping tip and technique that you prefer. You’ll need a 10 inch tart pan with a removable bottom to make this dessert but if all you have is an 8 inch tart pan then use that. Simply spread out the dough while filling the tart pan 3/4 way up and scoop up the remaining dough and bake a half dozen or so cookies on a separate baking sheet. Keep in mind to adjust the baking time accordingly! Enjoy with your favorite hot cup of coffee, tea or simply with a cold glass of milk! This recipe is a spine off from my Chocolate Raspberry Cream Cheese Cookies and the raspberry buttercream is the same used for in my Lemon Raspberry Spritz Cookies. When brownie meets cookie a delectable Triple Chocolate Brookie Tart is born. Made with dark cocoa powder, raspberry chocolate and mini semi-sweet chocolate chips then topped with a luscious raspberry buttercream. Makes a delightful chocolaty and fudgy dessert. You'll need a 10 inch tart pan with a removable bottom. In a large bowl or stand mixer, beat together the brown sugar, cream cheese and butter until light and creamy. Mix in the egg, egg yolk and vanilla until thoroughly combined. Stir the melted chocolate raspberry into the batter mixture. In a separate bowl combine together the flour, cocoa powder, baking soda and salt. On low speed mix the flour mixture into the batter mixture until combined. Scoop the batter into the prepared tart tin and smooth it out with an offset spatula until its evenly distributed. Bake in the preheated oven for about 20 to 22 minutes or until a toothpick inserted in the middle comes out clean. Take care to not over bake as the tart can dry out. In my oven, 20 minutes was sufficient and it had a soft yield to the touch. The tart will be puffed up slightly when ready and as its cooling it will deflate a little in the center. Transfer the tart pan to a wire rack and allow to cool completely before piping on the buttercream. In a small bowl beat ¼ cup of softened butter for 30 seconds on medium speed. Add ½ cup of icing sugar, 1 tablespoon of seedless raspberry jam and 1½ teaspoon of milk and beat until combined. Gradually beat in an additional ¾ cup of icing sugar. Transfer the buttercream to a piping bag with the 1M tip attached and pipe the buttercream around the edges of the tart. 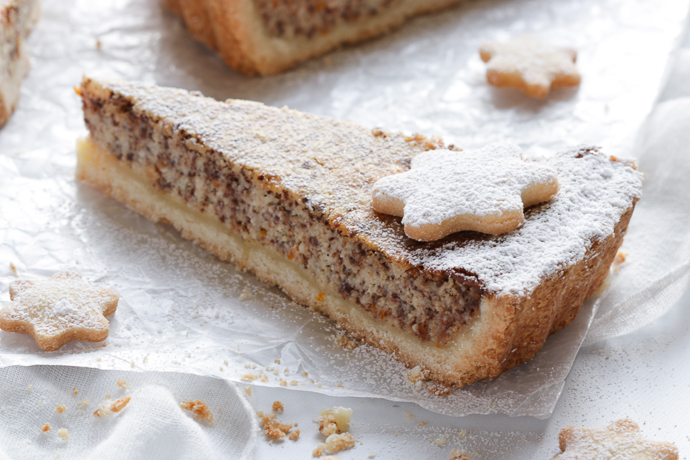 Dust with icing sugar then slice, serve and enjoy!